Disposable EEG electrodes provide high quality recordings while eliminating the risk of cross contamination between patients. Hospital Administration and Risk Management Departments alike recognize the value in ensuring the safety of all your patients. And disposable EEG electrodes are easy to cost-justify when considering the productivity gains realized by eliminating electrode cleaning and processing. Combine the savings with the improved patient care, and disposable EEG electrodes are a no-brainer! 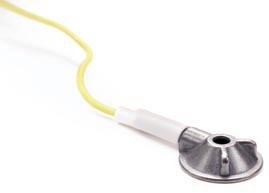 Our most popular disposable EEG electrode, the Deep Cup from Rhythmlink features a cup that is traditional in shape and holds 3.5 times more conductive material than their Slim Cup. Packaged in sets of 10 electrodes. Single patient use only. Part # Description Lead Length Quantity Sale Price Buy Now! The original disposable EEG electrode from Rhythmlink, the Slim Cup is designed for use on patients where skin breakdown may be a concern. The broad rim of the electrode distributes pressure over a greater area reducing the likelihood of patient injury. Best for use on the frontal, mastoid, and anterior temporal areas during longer EEG studies. Electrodes can be mixed and matched base on your needs. Electrodes can be mixed and matched base on your needs. Disposable EEG electrodes eliminate need to clean, maintain, and store after each use. No more troubleshooting worn electrodes. The silver/silver chloride sensor and tangle free wires result in consistently high signal quality 100% of the time. Unpack, use, and discard electrodes saving time on every study. One-time use only.